Summer temps have arrived and the heat is here to stay – at least for the next couple months. Working out in the heat is tough – and workouts are just a lot harder to get done when it’s hot out. The thought of putting on black yoga pants and sweating in a room filled with 40 other people? No thanks, I can probably sweat just as much without doing the vinyasas. 1) Dress For The Heat – If you’re going to be working out in the heat, don’t go out wearing a long sleeve and tights. You’ll burn up. Make sure you wear moisture wicking clothing – shorts, tank tops, or t-shirts. Put sunscreen on your face and any parts of your body that will be exposed. I’ve gotten some pretty hideous sunburns from not wearing sunscreen and trust me you don’t want that to happen to you. Wearing a hat or a visor that is moisture wicking is also a good idea, too. 2) Change Your Time – When it’s hot outside, the best time to workout is during parts of the day where the temperature is cooler. That time is usually in the wee hours of the morning or in the evening after the sun goes down. Try and wake up early and beat the heat by getting in a quick workout before most people have ever woken up. The sun is much more mild at this time and has not hit the peak of the day yet. Plus you can go the rest of the day satisfied knowing you already got your workout in. Score. If you can’t work out in the morning, going after the sun goes down is also a good time to go. Chris from What I Run Into beats the heat by waking up and working out at 6am in the morning. Go Chris go! 3) Wet Your Hair – This tip is from Melissa at TheValentineRd. She wets her hair before she goes for a run and that keeps her cool throughout her running. I really like this one, and am going to have to try it next time I go for a run. Smart thinking, Melissa! 4) Stay Hydrated- Hydrate, hydrate, hydrate! When it’s hot out it’s extremely important to make sure you are getting enough fluids. Make sure you stay hydrated throughout the day and also carry a water bottle with you when you’re running on hot days. There are all sorts of fancy water bottles these days that you can carry around your waist, your wrist, or just simply carrying them. Fitness Trainer Lisa Payne says she takes an Emergen-C Electrolyte Mix packet before she works out and makes sure drink to plenty of water when she’s outside. 5) Take Your Workout to the Water- I saved the best for last because this top is definitely my favorite and one that I pretty much always do. When it’s hot out, take your workout to the water! Instead of running and sweating up a storm, go for a swim! Hit the pool or heck, go for an open water swim. Or try a fun water related activity like surfing or stand up paddleboarding. I still sweat like crazy when I paddleboard, but at least I can jump into the water and quickly cool myself off. Or if you are a running warrior, you can try water running like my pal Teresa at Eat Drink and Be Skinny just did. That looks intense and I’m going to have to try it out sometime! Working out in the heat is tough so you need to make sure you are prepared. 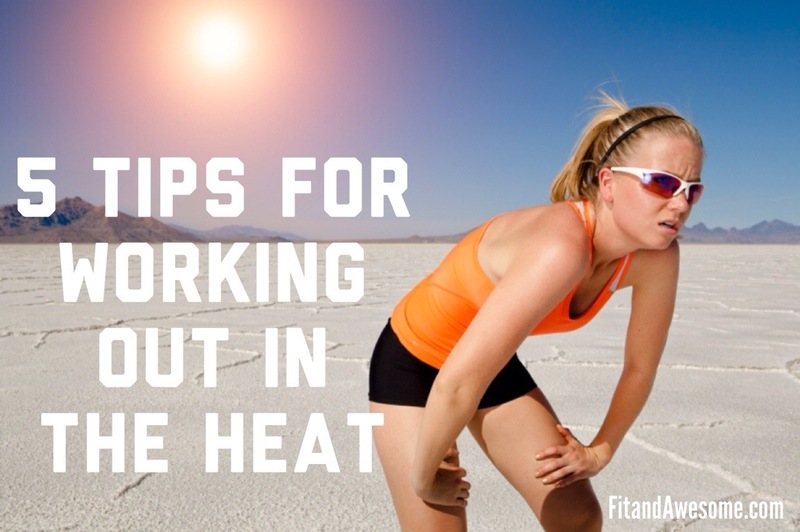 Modify your workouts based on the heat and if you don’t feel up to it, don’t push yourself too hard. Listening to your body is key and I hope these 5 tips for working out in the heat help you out! What about you? What tips do you have for others about working out in the heat? Do you modify your workouts? Post in the comments and let me know! Dress for the heat = AKA: GO NAKED!!! 😉 That’s how I ROLL! Hahaha, I bet you do! Nice!